July 23 , by Mardi Robyn. Take a look at these dainty Kate Spade inspired bracelets created by Stephanie from Henry Happened. The fun part about these bracelets is that you can create more than one in a matter of minutes and play around with different shapes of wire and colors of thread. Stephanie describes this tutorial as “How to make Kate Spade’s delicate string bracelets with tiny wire shapes. 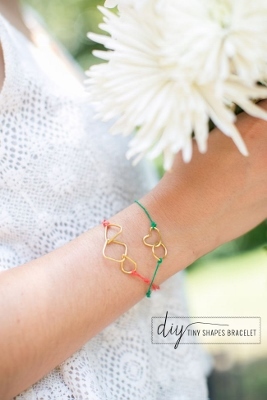 Perfect for summer stacking!” See for yourself how easy it is to make these DIY Tiny Shape Bracelets.